Refuting the charge of biased attitude of the Centre over allocation of funds to the state, Congress president Sonia Gandhi today blamed the non-Congress governments in Uttar Pradesh for the backwardness making a strong case for her party to be in power for all-round welfare. Congress party president Sonia Gandhi with her son and party general secretary Rahul Gandhi at the party's UP State Convention at Nanarao Park in Kanpur on Monday. Continuing his onslaught against BSP supremo Mayawati for using the ‘dalit card’, Congress AICC general secretary and Amethi MP Rahul Gandhi today turned it around to give the Congress workers a new direction by genuinely reaching out to the poor, Dalit and the youth. The Congress-led UPA government is under increasing pressure on price rise. Not only is it facing flak from the Opposition but it is also being targetted by Left parties that have issued an ultimatum to the Centre to curb inflation by April 15 failing which they plan to launch nation-wide protests. There is a possibility that Lok Sabha elections could be held in January or February next year after the results of assembly polls in the BJP-ruled states Rajasthan, Madhya Pradesh and Chhattisgarh are out, senior BJP leader L.K. Advani today said. The BJP today claimed that warming-up of relations between the Congress and Samajwadi party was because of corruption cases against former UP Chief Minister Mulayam Singh Yadav. As the promised deadline for elections is nearing, the caretaker government in Bangladesh appears to be moving quickly to bring to a logical conclusion the ‘political clean up’ launched by it, sources said today. From tomorrow, highly skilled applicants from India will be able to apply for UK visa under the Points Based System (PBS), Tier 1. This replaces the Highly Skilled Migrant Programme. The PBS is the new system for managing migration for those wishing to enter the UK for work and study. It is being introduced tier by tier. The All-Assam Students Union today fired a broadside at the Government of India as well as Assam Government for failing to meet the deadline for erecting a fence along the India-Bangladesh border stretch in Assam as agreed upon in the first Prime Minister-level tripartite meeting held in New Delhi on May 5, 2005. The Central Information Commission has asked the ministry of external affairs (MEA) to to present before it copies of letters written to the Indian government by the India’s former ambassador to Iraq on matter published in Iraqi’s national daily, Al-Mada, regarding recipients in the oil-for-food scam. To allay China’s apprehensions over the security of the Olympic torch, reaching India on April 17, following Tibetan protests, the Union Home Ministry today held a high-level meeting to decide about the measures to ensure its safety. The Supreme Court today refused to order investigation into the controversy involving Bollywood actor Amitabh Bachchan in the Barabanki land deal case in Uttar Pradesh. The district administration today booked Amitabh Bachchan for not paying proper stamp duty for the land purchased to open a girls college named after his daughter-in-law Aishwarya Bachchan and also issued notice to him for the same. A 39-year-old man was arrested from Delhi for allegedly threatening actress Sushmita Sen and sending lewd messages to her, the police said today. Acting on a complaint filed by Sushmita's assistant Rebecca Pereira, Amber Gaba was arrested from Delhi's Tilak Nagar locality yesterday, they said. A reportedly caste-based remark made by Bhartiya Kisan Union (BKU) leader Mahendra Singh Tikait against Uttar Pradesh Chief Minister Mayawati has caused violence and led to tension at Sisauli village in Muzaffarnagar district today. Residents of two villages in Bhayander, on the periphery of Mumbai city, are facing the wrath of the police after groups of vigilantes on the lookout for dacoits beat up an innocent man, leaving him seriously injured. New Delhi, March 31 In the face of stiff opposition from members of the Delhi Sikh Gurdwara Management Committee (DSGMC) to such a move, the Delhi Assembly today passed an amendment Bill seeking to increase the term of the executive board of the panel from one to two years. A large cache of arms and ammunition, including pen pistols, was seized by the city police from a private residence in the Basistha area in the city and three persons were arrested in this connection. Expressing concern over the suspension of the head of the Economics Department of Patna University, a group of academicians has asked President Pratibha Patil to intervene to revoke the decision immediately. Last year's runaway hit "Chak De India" dominated the Producers Guild Awards with the movie on women's hockey bagging five honours, including those for Best Actor, Best Director and Best Film. Superstar Shah Rukh Khan, who played belligerent coach Kabir Khan in the film, walked away with the Best Actor award while Shimit Amin was adjudged the Best Director. Eminent Malayalam poet Kadammanitta Ramakrishnan, who profoundly influenced Kerala's cultural realm over the last several decades, died at a private hospital in his hometown Pathanamthitta today. Concerned over ballooning inflation, the Reserve Bank today hinted at tighter monetary measures in its forthcoming credit policy, saying it was in “full readiness” for appropriate action to contain prices. On the recommendation of the Chief Minister of Jammu and Kashmir, union minister of road transport and highways T.R. Baalu has approved Rs 20.78 crore under the Central Road Fund (CRF) scheme for construction of 16-km village road (3.75 m wide) with retaining wall from Kahara Jai road up to Jaurn village in Doda district in Jammu and Kashmir. The Tamil Nadu government today announced that yoga would be made a compulsory subject in all schools in the state from the next academic year. School education minister Thangam Thennarasu, while replying to a question by Congress member S. Sekar in the Assembly, said efforts were already underway for this purpose. Seven activists of the banned Students Islamic Movement of India (SIMI) have been arrested on charges of providing assistance to their former chief Safdar Nagori and 12 other top leaders nabbed last week in a major crackdown against the outfit. Addressing a public rally at the historical Phoolbagh here, virtually launching the election campaign for the Lok Sabha elections, Sonia Gandhi attacked all Opposition parties in the state for its woes. "The BJP-SP-BSP have a nexus with each other to grab power in the state through their communal and casteist characters," the Congress president said while commenting "Saab ek thali ke chatte batte hai". Hitting the non-Congress governments hard, she said these governments had done nothing for the state. "All big projects in the state had been set up by the Congress government and now during the last 19 years, these political parties have only made efforts for their closure," she claimed. She said these parties had only strived to increase their own wellbeing while the people were left with no one by their side. The Congress was the only party which has made plans for the present and future of the masses while these parties did whatever they can to create division in society for their own political interests. Reiterating that the UPA government had never discriminated among the states in providing funds, she said, "It had to be seen whether the funds sent by the Centre were utilised honestly." After coming to power, the ruling political party represents all parties and there should not be any bias against any state or political party," she added. Asking the people to use the Right to Information (RTI) Act to grill the state government on apprehension of corruption in any schemes, the Congress president said the people have the right to know facts about public projects. Calling upon the people and the Congress workers to launch an agitation against the government to put pressure for honest implementation of the developmental schemes, she said that in UP everyone knew how the projects were being implemented. Voicing her concern over unemployment and other problems faced by the people of Kanpur owing to the closure of several textile and other industrial units, she assured that the UPA government would take care of the problems and would do whatever it could to give the people some succour. Congress general secretary Rahul Gandhi in his speech alleged that the present state government was not concerned with the problems of the people and raised the issue of lack of education and employment in the state. The young MP, while addressing the concluding session of the 2-day UPCC general body meeting, narrated two anecdotes that gave the party a new mantra and put a question mark at Mayawati’s brand of politics. He recalled that during his recent trip to Karnataka, he was surprised to learn that youths from UP were building the future of Karnataka. “I met a young man and got talking on various issues. He told me that youth from UP come to Karnataka to build his future and realize his dreams,” he said. Narrating yet another incident, Rahul said before that he had come across a Dalit in Etawah, who caught him by the hand and led him to his house. He told Rahul that Indira Gandhi had cared for them, Kanshi Ram used to think about them (Dalits). But now they felt betrayed, the youth confided in Rahul. Intertwining the two stories, Rahul Gandhi said the two stories were inter-related and lessons were to be drawn from them to change the future of the party in the state. The Congress-led UPA government is under increasing pressure on price rise. Not only is it facing flak from the Opposition but it is also being targetted by Left parties that have issued an ultimatum to the Centre to curb inflation by April 15 failing which they plan to launch nation-wide protests. 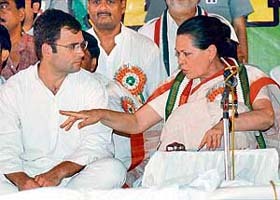 Even UPA allies have voiced their concern at the increasing prices of essential commodities that has hit the poor hard. Pushed on the defensive, the government convened a meeting of the cabinet committee on prices to monitor the situation while the Congress went out of its way to place the blame for the current runaway inflation on global pressures. Congress media department chief Veerappa Moily today put out several reams of paper to detail the measures already taken and further steps being contemplated by the UPA government to arrest price rise. Faced with a series of Assembly polls this year which will be followed by the Lok Sabha elections in 2009, the Congress is also worried about the adverse fall-out of price rise on its electoral fortunes. The Congress is particularly vulnerable on this issue as it fears its “pro-poor” plank, especially its slogan “Congress ka haath, aam aadmi ke saath” will stand demolished if prices of food commodities continue to rise. The party is, therefore, pressing the leadership that it convenes a special meeting of the Congress Working Committee on price rise. Admitting that the current inflation rate of 6.8 per cent is “disquieting”, Moily put it down to external factors such as worldwide crop failure and the sharp increase in the global prices of crude oil, commodities, food grains and metals. Moily said besides the steps already initiated by the Centre to check prices, it is planning to cut import duty on soya oil, incentives on exports of items steel and cement have been withdrawn while customs duties on many commodities are to be reduced. The Congress spokesperson was also at pains to point out that the UPA government had been sensitive to this issue and had banned future trading in some agricultural commodities like wheat and has cut duties on edible oils. While stoutly defending the Centre, the Congress also joined the others in asking the ruling coalition that it step up its efforts to take further measures to check the rising prices of food items. The party asked the UPA to take immediate steps to prevent smuggling and hoarding, streamling of the PDS and a contingency plan to check prices of steel and cement. 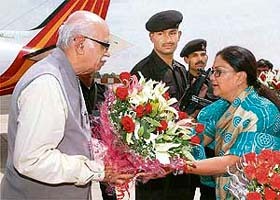 “The Lok Sabha elections could be held in January or February next year by the UPA government after assessing the results of the assembly polls slated in Rajasthan, Madhya Pradesh, Delhi and Chhattisgarh later this year,” Advani told a state party functionary meeting here. On the other hand, the Congress and Left parties feel they could face losses if they go for early Lok Sabha elections in the backdrop of nuclear deal with the USA, Advani claimed. Inaugurating the two-day meet, Advani warned that the anti-incumbency factor in assembly polls is never against the government, but “against the elected representative in his/her constituency”. Recalling the benefits of simultaneous Lok Sabha and Assembly polls till 1967, Advani, who is also leader of Opposition in lower house, urged the Centre for bringing a constitutional amendment to hold both the elections at a for fixed five-year terms. Asking party workers for self-introspection, he said “Swayam ko badalene ka offer deejiye ane wale vidhan sabha chunav mein (give a power to replace yourself in coming up assembly polls). The SP after becoming the major propellant of the Third Front is now having cocktails with the Congress because the CBI is the bartender. People of the country are now sick of the facade which goes on in the name of Third Front, party spokesperson Ravi Shanker Prasad said here. Prasad said that a Third Front in country's polity was illusory and meant only for political bargain. The comical political theatre which is presently going in the country in the name of the illusory Third Front clearly demonstrates that it is less of an ideological combination and more of a platform for convenient political bargain, he said. The saffron party claimed that the politics in the country is essentially bipolar with the BJP and Congress leading the two groups. The politics of the country has become bipolar now wherein the BJP and Congress are the principal parties leading the combination of two poles, he said. He alleged that the Left after enjoying power without responsibility for the last four years is now probing a possibility of the Third Front. BNP businessman Giasuddin Al Mamun and his wife were awarded rigorous imprisonment on March 27 by a Dhaka court for amassing huge ill-gotten wealth. He is stated to be on top of the corruption ladder of the bigwig corrupt politicians of the BNP era. With humble beginnings, Mamun became owner of 9,000 shares worth taka 33.94 crore in business and 45 accounts at home and abroad in the five- year rule of the BNP government that ended in January last year. Mamun is close to Tariq Zia, the kingmaker and son of the former Prime Minister Khaleda Zia, both of them in prison on corruption charges. A number of former BNP ministers and lawmakers, with close links to Khaleda Zia’s office, are reportedly his business partners and their syndicate allegedly amassed crores of taka. The conviction of Mamun is considered to be a signal to both Khaleda Zia of the BNP and the Jamaat-e-Islami, the former’s ruling alliance partner that even the top leaders would not be spared. This may also be seen as a pressure tactic as the caretaker government has given an option to Khaleda Zia and Sheikh Hasina of the Awami League to quit politics and leave the country. The alternative is conviction and imprisonment. The conviction of Mamun also conveys a warning to the BNP, which is seen re-asserting recently, that further drastic action is in the works. Political prisoners have now been denied mobile telephones, a facility they are enjoying so far. The Jamaati leaders, who have so far been spared of arrests, also may face trails now as the caretaker government vowed to clean up politics before the next elections are conducted. From tomorrow, highly skilled applicants from India will be able to apply for UK visa under the Points Based System (PBS), Tier 1. This replaces the Highly Skilled Migrant Programme. The PBS is the new system for managing migration for those wishing to enter the UK for work and study. It is being introduced tier by tier. Under the PBS, applicants will need sufficient points to qualify. Points are awarded for objective criteria such as qualifications, previous earnings, age and UK experience. The introduction of the PBS takes place at a time when fundamental changes are being carried out to the UK immigration system. This includes, in the first quarter of 2008, the completion of the global biometrics programme, the introduction of severe penalties for the employers of illegal workers in the UK and the creation of a unified UK Border Agency. In addition, as of April 1, the applicants who use false documents or deception to try to get access to the UK will face ban on coming to the UK for 10 years. Tier 1 is the first of five tiers of the PBS to be rolled out over the next 12 months. Tier 2, targeting skilled workers with a job offer and Tier 5, for temporary workers will both come on line in the third quarter of 2008. Tier 4, for students, will follow in early 2009. Tier 3, which covers low skilled migration routes, will only be used if shortages are identified that cannot be filled from the UK or European labour force. The All-Assam Students Union (AASU) today fired a broadside at the Government of India as well as Assam Government for failing to meet the deadline for erecting a fence along the India-Bangladesh border stretch in Assam as agreed upon in the first Prime Minister-level tripartite meeting held in New Delhi on May 5, 2005. The AASU today threatened to take recourse to intensive agitation in ‘consultation with the people of Assam’ to press for implementation of the neglected clauses of the Assam Accord including the sealing of India-Bangladesh border. AASU adviser Dr Samujjal Bhattacharrya informed that the PM-level talks among the Government of India, Assam Government and the AASU had agreed to complete fencing of 272-km-long India-Bangladesh border in western and southern Assam sectors by December 31, 2006. However, the deadline was extended to March 31, 2007 and again to March 31, 2008 because of sluggish progress of the work in the project that is being implemented by the NBCC. Meanwhile, the state government told the state Assembly that the fencing would be completed by March 31, 2009. “However, despite the extension of the deadline three times, the border fencing works are incomplete in 158 km out of the total 272 km. This has exposed the fact that let alone the state government, even the PMO doesn’t have the sincerity to seal the India-Bangladesh border in Assam to prevent illegal migration from the neighbouring country,” the AASU leader said. He said the tripartite talks on the Assam Accord implementation held on May 5, 2005 in the presence of Prime Minister Dr Manmohan Singh had raised hopes about implementation of unimplemented clauses of the accord signed in 1985 between the Government of India and the AASU that spearheaded the anti-foreigners movement in Assam during 1979-1985. “The sealing of India-Bangladesh border by erecting barbed wire fencing was one of the principal clauses of the Accord, yet the Government of India has shown no sincerity during the past 22 years to complete the fencing work,” he added. The AASU is demanding the resignation of Assam accord implementation minister Bhumidhar Barman for his “nonchalant attitude”. In January 2004, Al-Mada unearthed the scam by publishing names of companies, organisations and individuals allegedly bribed with hundreds of millions of oil barrels by former Iraqi dictator Saddam Hussein in return for political support and as payment for items prohibited under the “interwar” embargo in Iraq. The newspaper listed names of 270 persons, who allegedly profited from the illicit sale of Iraqi oil during the UN administered Oil-for-Food programme. In its interim decision, on an appeal by Banagluru-based appellant Arun Kumar Agrawal, the CIC directed the central public information officer in the MEA to present on Friday the original letter in sealed covers. Chief information commissioner Wajahat Habibullah has questioned the MEA’s silence on how disclosure of the information sought by the appellant would affect relations with a foreign state. On the MEA invoking Section 8(1) (a) of the RTI Act, which states that there is no obligation to give any citizen an information, disclosure of which would prejudicially affect relations with foreign states. While seeking information in September 2006 from the CPIO in the external affairs ministry, Agrawal had sought copies of the letter dated January 28, 2004, written by the Indian ambassador to Iraq to the government on the material published in Al-Mada. He also sought information on all other papers and file noting on the action taken on ambassador’s letter. Union home secretary Madhukar Gupta chaired a meeting of senior officials of the ministry to review the security arrangements for the Olympic torch relay. The meeting was attended by Delhi police commissioner Y.S. Dadhwal, senior officials of the Delhi government and representatives of the Indian Olympic Association among others. Earlier, Chinese envoy Zhang Yan had met Home Minister Shivraj Patil on March 27, and urged him to take steps to provide proper security cover to the Beijing Olympic torch during its run in India. China apprehends threat to the Olympic torch from Tibetan protestors who had earlier barged into its embassy here. The envoy had already raised the matter of safety of the Olympic torch with the external affairs ministry and the Indian Olympic Association here. National security advisor M.K. Narayanan had assured the neighbouring country that the Indian government would provide full security to the torch. Today’s meeting was significant in view of former defence minister George Fernandes calling for India to stay away from the 2008 Beijing Olympics. The apex court dismissed the petition filed by the UP government challenging the Allahabad High Court’s order restraining it from initiating any criminal, civil or revenue proceedings against Bachchan in the case. The high court had on December 11 last given a clean chit to the actor, observing that there was no finding that the actor “himself committed any fraud or manipulated any surreptitious entry in the revenue records”. Senior advocate K.K. Venugopal, appearing for the state government, contended that there was a case of manipulation in revenue records which ultimately benefited Bachchan and it needed to be investigated. Sub-divisional magistrate (SDM) Sriram Dubey said Bachchan had purchased two acres of land in Daulatpur village here last year. The star had been booked for paying less stamp duty under Section 42 A-3 of Indian Stamp Duty Act. A 39-year-old man was arrested from Delhi for allegedly threatening actress Sushmita Sen and sending lewd messages to her, the police said today. Acting on a complaint filed by Sushmita's assistant Rebecca Pereira, Amber Gaba was arrested from Delhi's Tilak Nagar locality yesterday, they said. Gaba is alleged to have sent eight letters and many SMSs and made threatening calls to Sushmita, a senior police officer from the Khar police station said. "He started sending SMSs and letters and called Sushmita in February. The actress ignored him initially and then decided to file a complaint when Gaba persisted," the officer said. The police reached till Gaba through his phone registration details and with the help of the courier company which had delivered the letters. Investigators are yet to ascertain Gaba's motive for troubling Sushmita and also the source through whom he received the actress' mobile number. Trouble started when the police arrived to arrest Tikait from his native village, Sisauli, late last night. Six persons, including two policemen, were injured as activists owing allegiance to the BKU clashed with the police. Heavy police presence did not deter local residents from resorting to heavy stone pelting. The police then reportedly retaliated by bursting teargas shells and firing into the air. However, consistent pressure from the BKU supporters forced the police to withdraw soon. After registering an FIR against Tikait under the Scheduled Castes and Tribes Prevention of Atrocities Act last night the police made an attempt to arrest him. He had reportedly made a remark against Mayawati at the Bijnore rally earlier in the day. Speaking at a press conference, he said efforts to arrest Tikait would continue despite resistance by his supporters. Giving it a political colour, Samajwadi Party state general secretary Shivpal Singh Yadav came out in open support of Tikiat. Meanwhile, Tikait said he had not made any derogatory references in his speech. His son, Surendra Tikait, was arrested with his supporters later in the afternoon. A pall of gloom hangs over the village after the police cracked down on the villagers and inflicted mass punishment on them for meting out vigilante justice to suspected thieves and dacoits. “The police did nothing when our houses were robbed by dacoits, but now when our boys are getting tough we are being tortured,” says a wizened Ratanmai Karkade from the Murdha village. Prakash Soni, a painter looking for work, was beaten up for being a suspected dacoit. Soni sustained serious injuries and is in coma. After the incident, which happened more than a week ago, the police intensified patrolling in the area and tried to arrest suspects. “But women in the village organised huge protests and gheraoed us forcing us to let the suspects go,” says a police constable, who was part of the operation. On Saturday, the police returned with reinforcements and armed with video recordings of the residents chasing away policemen, began a crackdown. “The police went door to door and dragged women out by their hair, beat them up and bundled them into police vans,” says one woman displaying bruises allegedly inflicted by the police. But the police says 24 persons have been detained for questioning in a bid to trace the men who attacked Soni. assaulted the painter and is on the lookout for them. Meanwhile, residents say they have now discontinued patrolling due to pressure from the police. “The police is keeping an eye on who comes and goes from these villages,” says Ramode Patil, an auto-rickshaw driver. According to him, dacoits from the Phasse Pardhi tribe clad only in underwear sporting well-oiled bodies periodically loot houses in the villages and assault them. area, told reporters that civilian patrolling should be in coordination with local police stations and suspects should be handed over to the police unharmed. In the face of stiff opposition from members of the Delhi Sikh Gurdwara Management Committee (DSGMC) to such a move, the Delhi Assembly today passed an amendment Bill seeking to increase the term of the executive board of the panel from one to two years. According to the statement of objects and reasons presented by the government, the Delhi Sikh Gurudwaras (Amendment) Act, 2008, was necessary as it has been seen over the years that the elections of the president or the office-bearers or other members of the board had never been held after one year and was delayed by several months. "As a result of this, there is a common feature of horse trading among the members to take support by one group or the other before completion of the annual elections," it said, adding ample time was wasted in reconstitution of the managing committees of various institutions run by the committee. The amendment to the Principal Act (Delhi Sikh Gurudwaras Act, 1971) means that the current president of the committee Paramjit Singh Sarna would continue in his post for another year. The rival members in the DSGMC, including the Delhi unit of SAD (Badal) and SAD (Panthak), while condemning the move, said they would move the Delhi High Court against the amendment. The police informed that a patrol party first apprehended two youths suspiciously roaming around on a motorcycle in the Basistha area during a routine check. On the basis of the lead provided by the youths the police raided the residence of one Manas Narzary from Basistha locality and seized three pistols, three pen pistols, five 5.56 pistols, one M-20 rifle, six magazines of 5.56 pistols and a large number of assorted ammunition. The police is interrogating the arrested persons to ascertain their identity and allegiance, if any, to any of the militant groups operating in the state. Police sources informed that the recovery of the pen pistols was a surprise and showed a shift in terror tactics by militants. A pen pistols has space for only one bullet inside it while 12 bullets can be loaded into a 5.56 pistol. Meanwhile, 18 militants, including 13 from the banned United Liberation Front of Asom (ULFA), today laid down arms before the GoC of the 2 Mountain Division of the Army at its Dinjan base in Tinsukia district of Upper Assam. There was a woman cadre among the ULFA ultras. Among the other surrendered militants, three were from the National Democratic Front of Bodoland, one each from the NSCN-IM and the NSCN-K. The militants deposited assorted weapons and ammunition while laying down arms. Over 40 senior academicians from Jawaharlal Nehru University, Delhi University, Jamia Millia Islamia and other institutions have submitted a memorandum to the President terming Professor Nawal Kishore Chaudhary’s suspension as an attack on an individual’s freedom of expression, the autonomy of universities and their democratic functioning as also the dignity of teachers. 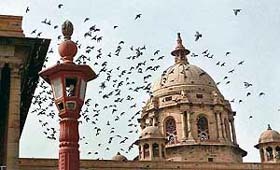 The academics complained that the recent dictates from the office of the chancellor to the universities of Bihar have shaken the very foundations of the universities. “It is reported that those refusing to surrender were intimidated, demoralised, transferred and put under suspension silencing their voice,” they said, adding these actions by the chancellor are unacceptable and the university teachers across India would protest against it. “We demand that the suspension of Prof N.K. Chaudhary be immediately revoked, the centralised control, the unnecessary interference of the office of the Governor of Bihar be stopped and the democratic functioning of the universities of Bihar be immediately restored,” they said. Last year's runaway hit "Chak De India" dominated the Producers Guild Awards with the movie on women's hockey bagging five honours, including those for Best Actor, Best Director and Best Film. Superstar Shah Rukh Khan, who played belligerent coach Kabir Khan in the film, walked away with the Best Actor award while Shimit Amin was adjudged the Best Director. Writer of "Chak De India" Jaideep Sahni received the Best Screenplay and Best Story awards at an award function here yesterday. Young filmmaker Imtiaz Ali's romantic comedy, "Jab We Met", received three awards, including one for Kareena Kapoor in the Best Actor category and music composer Pritam. Ali won the Best Dialogue award. Konkona Sen Sharma and Irrfan Khan won awards in the Best Supporting Actor category for their performances in "Life in a Metro". Aamir Khan's directorial debut "Taare Zameen Par", which swept the Filmfare Awards, was conspicuous by its absence as it released after November 2007 deadline for the nominations. Singers Shreya Ghosal and Shaan won awards for their song in "Guru" and "Saawariya", respectively. Veteran lyricist Gulzar won the Best Lyrics award for "Guru". Veteran filmmaker Yash Chopra was felicitated for his contribution to Indian cinema. Ranbir Kapoor and Deepika Padukone won honours for their debut performances. Salman Khan and Govinda won the award for Best Jodi for their work in "Partner". He was 73 and is survived by his wife and two children. Ramakrishnan had been under treatment for cancer for the last few months. Besides being a powerful voice, Ramakrishnan had played a vital role in reviving interest in poetry among the modern generations through the recital of his works covering every nook and corner of the state. Widely hailed as a writer who liberated poetry from academic circles and scholarly parlours, his dramatic recitals in towns and villages earned him a wide fan following cutting across class and social barriers. Known for their force, energy, folk-touch and novelty of themes, Kadammanitta's poems left a stunning impact on the audience that always drew in large numbers to hear him. His work stood apart for its outright rejection of belaboured and pretentious modernity as he successfully seized on the oral, folk and tribal literary and artistic traditions even while dealing with contemporary realities. “Inflation is unacceptably high...we are very, very concerned...we are in full readiness to take appropriate action to contain inflation,” Reserve Bank of India (RBI) Governor Y.V. Reddy said, a month ahead of the credit policy, to be announced on April 29. Inflation spiralled to 6.68 per cent, much beyond the RBI’s comfort level of five per cent, prompting Finance Minister P. Chidambaram to stress that the government would take all measures, monetary, fiscal and supply side, to combat it. Attributing the sudden spurt in inflation to a surge increase in prices, mainly of food, fuel and metals, Reddy told reporters that some inflationary pressures were expected when the central bank reviewed its monetary policy in January. “Inflation has (now) turned out to be well more than anticipated,” Reddy said on the sidelines of a function here. This road will connect Kahara village in Bhalessa area with Jai in Bhaderwah. Passing through the villages of Gugara, Malanu, Bithola, Bagdair, Halaran, Jooda and Shamdalian before entering picturesque meadows of Jai, the road will open up avenues of development for people in these villages, say ministry officials. The Tamil Nadu government today announced that yoga would be made a compulsory subject in all schools in the state from the next academic year. School education minister Thangam Thennarasu, while replying to a question by Congress member S. Sekar in the Assembly, said efforts were already underway for this purpose. Five activisits were apprehended early this morning from Unhel town near Ujjain, which, police said, was a major centre for SIMI activists to carryout their anti-national plans. The arrested are Jabil Parvez - brother of Aamil Parvez who was held last week - Aiyaz, Akbar, Irshad and Mehruddin, Sub Divisional Police Officer (SDOP) Sanjeev Singh told PTI.